no one should be surprised that such an institution took place in Southern California. The esoteric sects that proliferated in the state at the turn of the last century had myriad connections to modernism in the arts. Another problem with categorization (of the regions of California) and labeling. Ojai … is a city in Ventura County in the U.S. state of California. Located in the Ojai Valley, it is northwest of Los Angeles and east of Santa Barbara. … Ojai’s culture is heavily focused on ecology, health and organic agriculture, walking/hiking, spirituality, music and local art. It is often seen as a hippie-friendly city, and many New Age shops exist. … The Ojai Music Festival (founded in 1947) is an annual festival of performances by some of the world’s top musicians and composers, and occurs on the first weekend after Memorial Day. Notable appearances include Igor Stravinsky, Aaron Copland, Esa-Pekka Salonen and Pierre Boulez, who was festival director in 2003. The assumption here is that there are three coastal regions between the San Francisco Bay and the Mexican border. 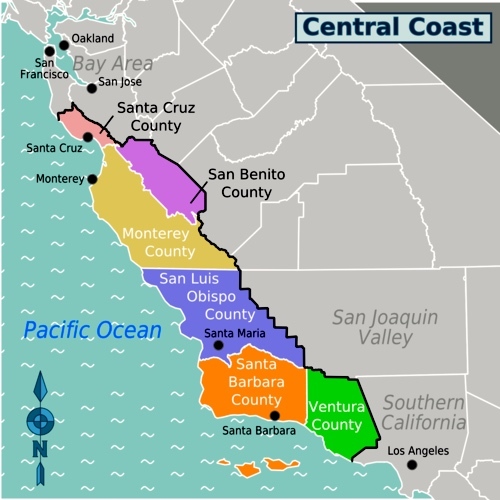 Notice that Ventura County is quite close to Southern California — and at the other end, that Santa Cruz County is quite close to the Bay Area (in Northern California) and is often thought of as an outpost (culturally as well as geographically) of the Bay Area. The categories are not culturally crisp. … For CSA [Combined Statistical Area] metropolitan purposes, the five counties of Los Angeles, Orange, Riverside, San Bernardino, and Ventura are all combined to make up the Greater Los Angeles Area with over 17.5 million people. … “Southern California” is not a formal geographic designation, and definitions of what constitutes Southern California vary. Geographically, California’s north-south midway point lies at exactly 37° 9′ 58.23″ latitude, around 11 miles (18 km) south of San Jose; however, this does not coincide with popular use of the term. When the state is divided into two areas (northern and southern California), the term “Southern California” usually refers to the ten southern-most counties of the state. This definition coincides neatly with the county lines at 35° 47′ 28″ north latitude, which form the northern borders of San Luis Obispo, Kern, and San Bernardino counties. … The state is most commonly divided and promoted by its regional tourism groups as consisting of northern, central, and southern California regions. As with areas like the South (of the US), there is no simple and easy definition that works for both geographical and (a wide range of) cultural purposes. For human purposes, the categories are not crisply differentiated. This entry was posted on July 7, 2015 at 6:59 am and is filed under Categorization and Labeling. You can follow any responses to this entry through the RSS 2.0 feed. You can leave a response, or trackback from your own site.